There's little question that the Fire stole the show at last week's Amazon event. After all, the new tablet marks a change for the company's Kindle line, which until now has been defined by relatively simple E-Ink-based devices. The Kindle Touch, meanwhile, stepped up to bat to take on the likes of new Nook and Kobo touchscreen readers. But while most expected that device to become the heir to the Kindle throne, the company made a something of a surprise move, offering up a new device that will bear the reader's name. Now in its fourth generation, the Kindle has shed its keyboard and been reborn as a pocket-sized, lighter-weight reader. And a cheap one, at that -- $109 for the standard version and $79 for the ad-supported. 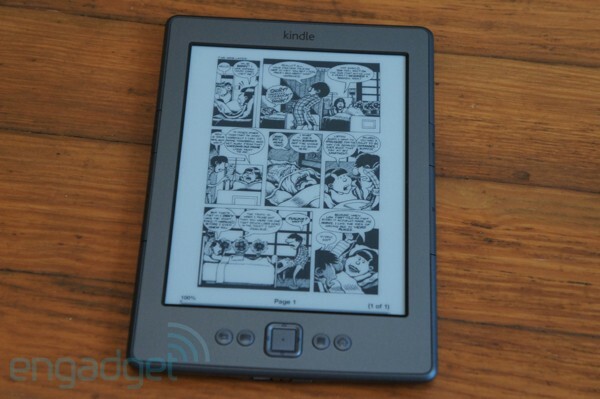 So, is the new Kindle worthy of the name that has become synonymous with e-readers? Or did the company make too many sacrifices in the name of slashing prices? Find out in our review after the break. The latest Kindle forgoes bells and whistles such as a touchscreen or physical keyboard, making it one bare-bones device. Still, you'll be hard-pressed to find a better e-reader at this price. 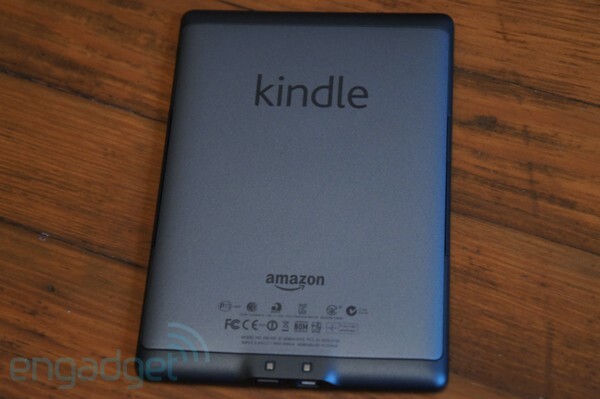 How would you rate the Kindle 4th-gen? The new Kindle really is rather small compared to past versions, and the company isn't kidding when it calls the thing pocket-sized -- it slips quite nicely into a pant pocket. You might run into a bit of trouble attempting this after putting the reader in Amazon's proprietary case, but even then we managed to fit the device in our jeans with little effort. The reader shaves an inch from the height of its predecessor and 0.3 inches from its width, though it expands a hundredth of an inch in thickness to 0.34 inches -- a pretty indistinguishable change, to be honest. The new Kindle's dimensions are pretty much on par with the latest Kobo reader (though Amazon's reader does come in a few fractions of an inch thinner), making the 0.47-inch thick Nook Wi-Fi look downright beefy by comparison. At 5.98 ounces, the new Kindle is also easily the lightest of the bunch, weighing in at about 2.5 ounces lighter than the last-gen model. The device owes much of its smaller footprint to the company's decision to abandon the keyboard this time out -- a decision that may rub some Kindle devotees the wrong way. Though at the moment, the QWERTYriffic Kindle 3 is still on the market, on sale under the moniker Kindle Keyboard, with a $99 / $139 price tag for the WiFi and 3G versions. 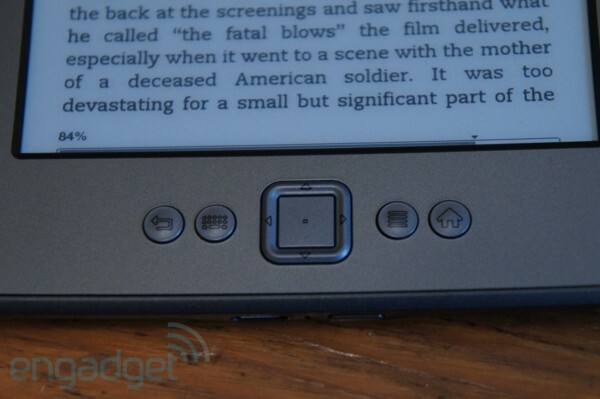 In the case of the new Kindle Touch, Amazon stole a page from the Sony / Nook / Kobo playbook, replacing the keyboard with an infrared touchscreen. The new $79 Kindle, on the other hand, has neither of these things, and instead requires you to interact with it using physical buttons. You'll find long, skinny page buttons flanking the display on both sides. The rear of the device is rubberized to prevent slipping, but isn't quite as grippable as the Nook's concave back, so attempting to flip through pages while holding the device with a single hand is a fairly clumsy task. The loss of some real estate also makes the device more difficult to hold than the last generation Kindle. A row of small physical buttons lines the device's bottom bezel -- Back, Keyboard, Menu and Home. In the middle of the row is a small toggle pad with arrows for navigating the reader's menus, with a small button in the center for choosing items. The power button is located on the bottom edge of the device on a slightly protruding lip alongside the microUSB slot. Along the bottom of the reader's back are two small metal pads, which, when plugged into one of Amazon's $60 cases, power a built-in light to illuminate the non-backlit screen. Not surprisingly, there's no 3G option on the new Kindle. Amazon no doubt assumed that anyone who was willing to shell out for such functionality would also likely drop the extra cash for the Touch version. Support for audio files like MP3s and text-to-speech has been dropped as well. And really, it would be silly to dock the company for the lack of that option on what's truly meant to be a low-cost, entry-level device. As with past Kindles, Amazon opted to forgo the expandable memory here, instead relying on the device's built-in 2GB for downloaded texts That's the same amount of storage included on the Nook and Kobo, which both have microSD slots and half of the previous generation Kindle (and the Touch, for that matter). But while the relative lack of storage is less than ideal, keep in mind that Amazon also lets you store texts in the cloud, taking some burden off the device itself. For such a low-cost device, the Kindle's build feels really solid with a strengthened plastic faceplate that feels almost metallic and a sort of solid construction that belies its weight. Drop the extra dime for one of Amazon's cases, and you have a device that should stand up to hours spent in a book bag or another carrying case. Amazon has also bumped up the processor to 800MHz (from 532), the same as the ones found in the Nook and Kobo readers. Despite shaving off a precious inch from its footprint, the new Kindle manages to maintain its industry-standard six-inch display. 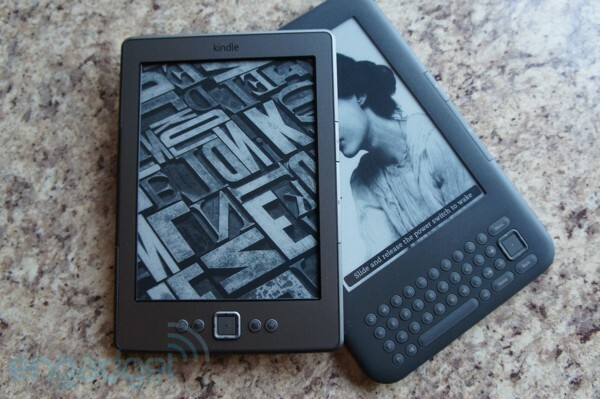 Like the Nook, Kobo, Sony, et al., theKindle is built around a sharp Pearl E-Ink screen, offering up the same 600 x 800 resolution and 16-level gray scale as its predecessor. The text really does pop, and unlike its LCD-based competition, it's quite readable in sunlight, a long-time selling point for Amazon. The reader's page turn rate is on-par with the latest generation readers, as well -- we put it up against the new Nook and Kindle 3, and couldn't detect a difference in speed, with both devices doing a full page refresh about once every six pages. As with the last version of the Kindle, you can lop a significant chunk off of the product's price by opting into the ad-supported version. Amazon CEO Jeff Bezos suggested during last week's event that the device's advertising is so "beautiful" that a user who didn't know any better would just assume that they were standard screen savers. Not surprisingly, this isn't really the case here -- at least not with the ads we saw. All were pretty clearly advertisements, including ones for AT&T, the film Anonymous and, of course, Amazon itself, which was far and away the biggest advertiser we saw. That said, the ads aren't very intrusive, as they only pop up when you put the device to sleep or when you're looking at the home screen, which has small banners lining the bottom. For those who don't mind one ad delivery method in an already saturated world, the option may well be worth the $30 savings. The Kindle's lack of a touchscreen isn't a particular nuisance until it comes time to type. Clicking the keyboard button on the button bezel will bring up a virtual QWERTY. In this bare-bones model, typing means cycling through the letters using the navigation pad, which can be a pain when searching for books in the store. For anyone who plans on doing some serious typing on the thing -- though we're not entirely sure why someone would -- it may be worth the extra $20 to upgrade to the Touch. Firing up the device will bring you to a simple homepage with a list of all of the items you've purchased and a link to Archived Items, which gives you access to content stored on other Whisper Synced devices. A bar along the top lets you know the time, the strength of your WiFi single, battery life and how much storage you've got left. Clicking the Menu button while on the homescreen gives you the option to visit the store, sync your content, rotate the screen's orientation and visit the settings. There's also a search feature, which brings you to a central page where you can find keywords on the device, the Kindle Store, Wikipedia, the built-in Oxford American Dictionary, Wikipedia and the Web. Entering text in the search field requires hitting the Keyboard button. The browser is, of course, quite basic, with a simple search bar on the top, where you can enter a URL or a keyword, using the toggle switch to switch between Go To, Wikipedia and Google. Press down on the arrow key will display a large box with a magnifying glass for zooming into a page. The page layout is fairly simple, with the vast majority of the space taken up by the text, with the menu bar from the homepage carrying over. Hitting menu brings up options to search the text, read a description and, in the case of a sample, purchase the book. You can also adjust the font from here, choosing from seven sizes, three typefaces and three line spacing options. At the bottom of the page there's a progress bar, letting you know how far you are in the book. With the toggle pad, you can also select words to look up and annotate. As with past versions, the new Kindle reads TXT and PDF files, which you can drag onto the device onto the device via micro-USB. When looking at PDF files, the Kindle lets you zoom in and out and adjust the contrast. As with other readers, the whole process is fairly clunky and slow, but it's a nice feature for anyone who wants to review business documents on the go or import their own non-Kindle Store files. If you've ever played with a Kindle, it shouldn't surprise you to learn that the fourth-generation is one solid device. The hardware is well made, the processing is snappy and the screen is extremely easy to read. It is, however, sorely lacking in the bells and whistles department, with a renewed, almost one-track focus on reading. Nowhere is this more evident than in the lack of a keyboard or touchscreen, making browsing quite the chore. Naturally, though, typing is at best a secondary feature on a device like this. 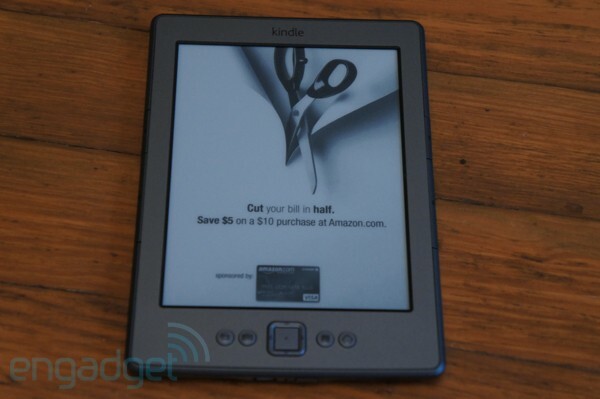 And if you felt strongly enough, you could always get the Kindle Touch for an extra twenty bucks. Ultimately, though, this question of value comes down to price. 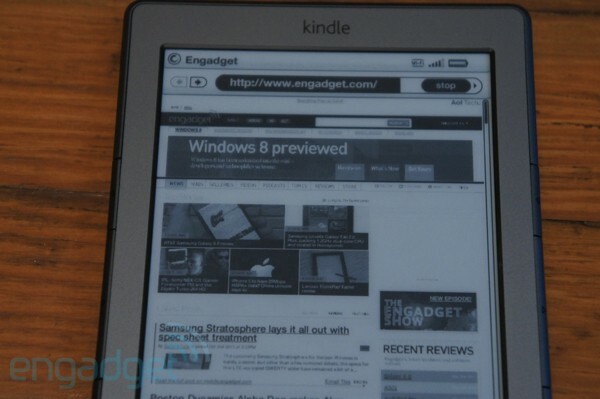 The Kindle is $79 with ads and $109 without -- a steal compared to the $139 launch price of the Kindle 3 and Nook WiFi. We've heard that the Kindle tends to be a money-loser for Amazon, with the company earning back its hardware losses with strong book sales, and that may well be the case here. But at that price, the new Kindle is likely to end up in the hands of users who have been eyeing e-readers, but are loathe to part with $140. And while this certainly isn't the best or most fully featured e-reader we've seen -- and can't be considered an upgrade over last years model, the new Kindle is the best e-reader $100 (or less!) can buy.